Didn’t blog yesterday, as all I did was move my pinhole cameras from one location to another. I did go into the Menin Gate for the 8-00pm remembrances. It was one of the nicest I have witnessed as there were only a few people and very few camera flashes going off. At 11-00pm I placed my time-lapse camera in a field near Berlin Wood. Today I went to Mesen and left 5 cameras there in and around the Bunkers on the battlefield. I also left a camera in a bunker on the Passchendaele battlefield. I then drove to Ploegstreet Woods and visited the 4 Cemetery’s in it. One was called Mud Corner and it had 53 new Zealand graves in it. Image from it below. It was a very peaceful Woods and I enjoyed the walk. There were a number of bunkers in it. Images from Wood below. I came back and spent the rest of the day at Varlet Farm as it is very quite as I am the only one here tonight. Going off at 11-00pm to pick up time-lapse camera from field. Got up had breakfast and headed to a meeting with Steven at Mesen. He showed me where my work could be exhibited and I am happy with space so we are know working on getting funding for exhibition costs. Headed down to Ploegstreet where the Xmas truce and football match was supposed to have taken place. Image below of monument. Also took image of Bunker now used for chicken run. Went to move the cameras left yesterday near Reutelbos and placed them in the Woods close by. Placed other cameras near Berlin Wood and along old railway track that looks over the battlefield. Placed then into the mud so hope to get interesting images. Also placed pinhole camera in bunker. 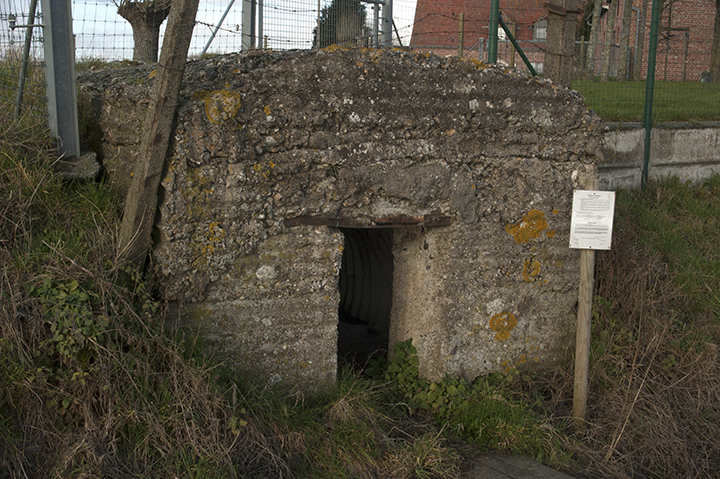 Image of bunker below. Went to dinner with a friend then on way back picked up time-lapse camera facing Berlin Wood. Results look fantastic so placed it back out near the Woods but face up just to document the sky over the battlefield. That’s it for the day. After breakfast took off to Polygon Wood and picked up cameras. Went to meeting at Zonnebeke Museum and was given map with all locations of where the New Zealanders had been. Set up cameras near Reutelbos, image below is of old German Bunker where the New Zealanders where. Picked up time-lapse camera in the evening and places a couple of pin-hole cameras out near berlin Wood. Rest of time spent resting at Varlet farm. After breakfast went to Polygon Wood and changed the position of the pinhole cameras and picked up the time-lapse camera. It appears that on Sunday Belgium’s go walking as they were all over the place down all the country roads there were hundreds of them. I had a quite day and just checked out a couple of bunkers in Zandvoorde and Hollebeke. The image below is from the German Command Post in Zandvoorde. Spent the afternoon resting and then went and took a couple of night images of Berlin wood and Tyne Cot Cemetery. I have an appointment with one of the Researchers at Zonnebeke Museum tomorrow who is going to give me detailed maps of location that the New Zealanders where in so I can plan to leave out more pinhole cameras in the correct locations. Took off at 10-00pm Thursday night and got into Dover at 01-45am so got the 02-00am ferry crossing and without sleep got to Dunkirk at 05-00Am. Headed straight to Ypres arriving around 06-00am. Parked up and slept for about an hour then drove over to and spent my time walking around Tyne Cot Cemetery until my meeting with the guys from the Zonnebeke Museum and Old Cheese Factory at 10-00am! Great meeting, we are going to show my work at the old Cheese Factory in the later part of 2017 as this location is in the path of the advance of the New Zealand Soldiers on the 12-10-1917. I have agreed to be there on the 12-10-2017 to hold talks on my work and document the 24hour period of the 100th Anniversary of this event so entrenched in the hearts and minds of New Zealanders. After meeting I headed off to my B&B which is, Varlet Farm a fantastic place where I have stayed before. Had a rest and then went over to Polygon Wood to check out the site I wanted to leave my pinholes the next day. Got up today had a good breakfast made my lunch and headed off for the day. I first went to Polygon Wood and set up a Time-lapse camera to record every 10 minutes for 24 hours. I then placed 5 Pinhole cameras looking up through the trees into the sky as I have a new idea as to what my final image presentation will be. These 4 images are off the Time-lapse Camera, Pinhole camera and what it is seeing and the area I placed them in. (I hope I can find them all!). That was work done for the day so decided to start having a good look around the area. First stop was Hill 60 and to see a bunker I have seen a lot in photos. Next image is a close up of the bunker. It was a very interesting site. As a lot of my work is underground I have always wanted to see this site. Next headed off to Sanctuary Wood but was put off by the whole touristy thing that seems to be there now. Just down the road and a much more interesting site for me was Hodge Crater so had a walk around there. My next image is a homage to Roger Fenton (if any of my students are reading this Google him and find the image I am talking about). After a quick lunch headed off to see the German Cemetery at Langemark. Found this a sad place and not as well kept as the Commonwealth grave sites. I suppose it doesn’t help that the crosses are all black. There was a piece of interesting art work against one of the walls of the cemetery which I liked. Below is an image of it. The rest of my time out was filled with visiting many bunkers with the Ziegler Bunker being the most interesting. Image of it below. That’s it for today. Will change site of Pinhole cameras and Time-lapse camera tomorrow and visit more sites. My new website has just gone live. The results from yesterday were fantastic and they were very happy with them. The Director of the Caverne Anne has been really helpful and has shown me the location of two large underground sites that are not locked up and access is available all the time. They are both very big sites with interesting graffiti in them. I have attached images of their entrances along with an old photo of what one of them was like during the war. Anne has also agreed to help get me into at least another three sites that are not available to the public. One in particular sounds amazing and it has fantastic carved objects and inscriptions from Germans, French, American and Irish. They were so helpful and this has been a major new development to my work. In July I will mainly be working here. At end of day headed for Arras to be ready for my meeting tomorrow with Alain the Archaeologist that discovered the Quarries in Arras. Above ground today was wet. Went to the Caverne du Dragon today. I was taken around and shown where all the inscriptions were. This is a very interesting as it is on the Chemin Des Dames and at different times was occupied by the Germans and the French and some times both at the same time. This was my first opportunity to work with German text which, was very exciting. All the text was from German Officers leaving instructions for the men. It was important to make a good impression with my work as there is a lot of other underground locations in this area. I spent about three hours down there and got some interesting images. Images are of instructions left by German Officer for his troops. Hi Had a very quite day today and just did some paper work in the morning. Went and picked up my pin-hole cameras in the afternoon. Spent a little bit of time taking a few digital reference images. They use special lighting near the Champange that is really a warm orange which you can see in the attached images. Most are of the space however, there is some writing and images on the wall and I have attached one of them. These tunnels where used a lot in the war and I am hoping to come back to document more of the inscriptions and drawings on the walls. Tomorrow I am under ground again at Caverne du Dragon which I am really looking forward too. Above ground today was cold. Hi Left Verdun and headed to Reims. On the way stopped off again in the Argonne Forest and found the location of “The Lost Battalion”. His is an amazing story and was pleased to find where they fought. There is a monument near the location and, on it there is a sculpture of a pigeon. A message was attached to this pigeon to advise that they where being bombed by their on guns and to please stop. This bird was shot in the breast, lost an eye and a leg but still got through. Its name was Cher Ami. On arrival in Reims I went to the Champagne House called Ruinart and left seven pin-hole cameras underground in their tunnels to expose for 24 hours. Digital reference images speak for themselves. Today above ground was warm. Hi Not much to say about the first day, I got up at 2-00am and arrived in Verdun at 4-30pm French time. Just a lot of driving and waiting on the ferry! Today I visited a number of sites all above ground as my work underground will be in Reims and Arras later on in the trip. As I had time I just wanted to visit other areas of importance to the war to get a better overall view of the event. It also allowed me to work in film with my Hasselblad Xpan to explore the landscape of the war above ground. Today I visited Fort de Douaumont which must have been hell on earth to be in during the war. I also visited three villages that were totally destroyed in the conflict and never rebuilt, they were Fleury, Douamont and Bezonvaux. There was a very strange silence at these sites. The National cimetiere was hugh with a massive building housing thousands of soldiers names and the Tranchee des Baionnettes. They were both very moving. The other two sites I visited were Camp Marguerre the site of the 'Long Max Cannon' which were fantastic to photograph. So overall a big day and tomorrow I will be exploring the Argonne Forest where the Americans and French were. I have attached three photos as digital reference images they are from Camp Marguerre and a Tranchee des Baionnettes. Started by moving pinhole cameras at Vimy to new locations. After that headed to Bouzincourt and spent four hours underground there capturing another 240 inscriptions. Back there again all day tomorrow. Before that we will pick up the cameras at Vimy and head to Wellington Quarries where the boys from Wellington College are visiting and they always do a Haka which will be great to document. Above ground today was warm. Yesterday we went to Bouzincourt and after signing our lives away we started 5 days of documenting the space under the church. There are about 42 rooms to document and after 10 rooms have already got over 200 inscriptions! Today went up to Vimy Ridge and meet the director there called Guy who took us into no go areas to place 4 pinhole cameras for my 24hour battlefield project. In the afternoon meet up with David from the Durant Group who gave us access to an underground space at La Maison Blanche were they are working and documenting. It was very interesting and I was allowed to take images to place on my web-site which I will do on my return. Tomorrow we are back at Vimy to move cameras and the rest of the day we will be at Bouzincourt. Today above ground was very warm. We had a great day today as we spent time in Wellington as there was a two hour gap at lunch time. It was really good to spend time and we found about six more NZ names and NZE logo inscriptions. We then went into Auckland and I documented all the NZ names again with a different digital camera. I will not be releasing any new images of my work at Arras as I do not want any more of my images in the public domain at this time. We are going to work under Bouzincourt Church tomorrow and I will be placing images from this shoot on my blog. Today above ground was really hot. During my stay here this time I am also working on my other project above ground documenting the battlefields involved with the battle of Arras. We went to Bullecourt today to look at one and I have decided that over the next few days I will leave pinhole cameras exposing for 24 hours. I am not sure how it will go as it is very sunny over here! We pop in on Wellington Quarries and caught up with Isabelle. Tomorrow during a two hour break I will look to document the Wellington Quarry as this is one of the last for me to do. After that we will spend some time exploring the other areas. I will be mapping the areas the NZ text are in and the groups of names in the different areas to see how and where they worked. This is just an up date to say we will be heading back to Arras on the 12th of this month. Look out for the daily blogs. Hi We headed out of Arras early and arrived in Zonnebeke around lunchtime. I am starting my second major project with the exposing of pinhole cameras for 24 hours on the battlefields in Belgium. You can see my proposal for this project on my website under WW1 Landscapes along with the new blog title that I will be doing for the rest of this trip. We meet up with our contact at Zonnebeke Museum Lee. I told him I wanted to place cameras in and on the field in front of Berlin Wood. We went by it earlier and found the name of the farm by the field was Beecham Farm so he went with us and got permission from the farmer for us to place cameras on his field. I loaded 4 of the film backs with Ilford HP5plus and we headed back to the Farm and placed 4 cameras facing Berlin wood. We will pick them back up late tomorrow and place them in Berlin wood. Two images are the cameras in their boxes placed for 24 hours the other is with a pinhole camera with Direct Positive paper in it which was exposed for 8 minutes. Above ground today was very cold.